With Labor Day weekend coming up soon, I thought I'd reminisce about last year's Labor Day trip to Horse Cave, KY. Brian and I set out early that day to tour Horse Cave as well as Diamond Caverns in nearby Park City because you just can't beat being in a cave when the weather's hot and humid. Kentucky is famous for its many limestone caves, but we chose to go to lesser-known ones in order to avoid the holiday tourist rush. We started in Horse Cave, KY where we found a practically abandoned Main Street. After a quick look around the caving museum, we descended into Horse Cave which (according to Wikipedia) housed the world's only air-conditioned tennis courts around the time of World War I. In fact, several of of the historic buildings located on Main Street got their air condition by pumping cool air out of the cave. 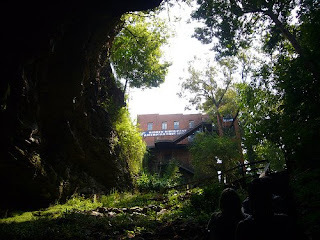 The town also got their drinking water from the cave, and unfortunately it became severely polluted with sewage and the cave was forced to shut down to tours for 50 years. Due to reclamation efforts, the cave now boasts pristine waters once again. 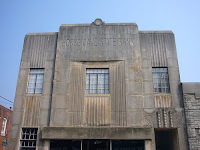 After our tour of Horse Cave, we drove down historic Highway 31W (aka Dixie Highway). 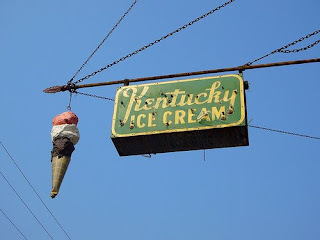 Highway 31 originally began as a buffalo path and later became the first paved road and toll road in Kentucky. For you fellow Tennesseans, 31W eventually becomes the blighted, prostitute-ridden Dickerson Rd. in Nashville. 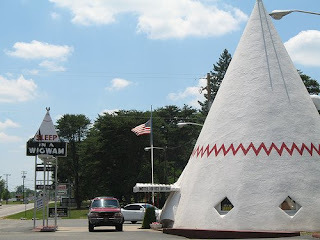 Highway 31W in KY, however, is full of kitschy mid-century tourist traps such as the Wigwam Village motel (built in 1935) and greasy Shoney's-style diners such as Jerry's. 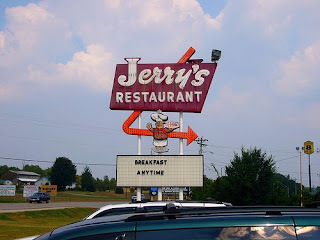 We couldn't resist the charm of Jerry's neon sign and the fact that my dad's name is Jerry, so we decided to eat lunch there. It was nothing spectacular, but we noted that slaw comes with EVERYTHING on the menu. Last stop on our trip was Diamond Caverns. This was a bit more of a tourist trap and although it has some nice formations, the tour just wasn't as interesting as Horse Cave. So if you happen to be in KY, I'd recommend driving Highway 31W between Horse Cave and Cave City, and skipping Diamond Caverns. Finally, I'll close with this picture of me kissing a giant concrete ape outside what appeared to be an abandoned motel on Highway 31. Update: Jerry's restaurant and awesome sign is sadly no longer. So if you're looking for nearby eats, well....good luck. We ended up at the A&W/Long John's Silver combo across the street.